A strange thing happens when I hear about a restaurant dish that I really want to try. I guess it would be normal for me to want to go to that restaurant and try it, however, since I never really want to leave the house my first inclination is to try making it at home. a picture I found on Flickr. Apparently it's done as a place called Earl's Beer & Cheese in New York City. Sure I live only about 30 minutes from the restaurant but who could really be bothered to make that trip? Especially when all the ingredients are listed right there in the description! 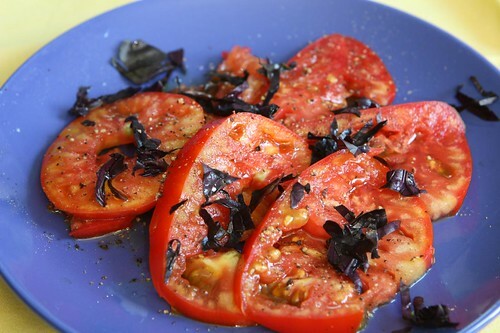 When I was young my father used to have a tomato as a side dish for dinner most nights in the summer. Often he would simply put black pepper on it, sometimes mayonnaise. I always thought this was disgusting because I was a crummy kid who disliked tomatoes. Now I see things differently. One of the farm tomatoes was starting to turn so I decided that I'd slice it up with a little salt, pepper, olive oil, and sliced opal basil from the farm. I wasn't exactly breaking new ground with that use of a tomato but it was quite delicious. 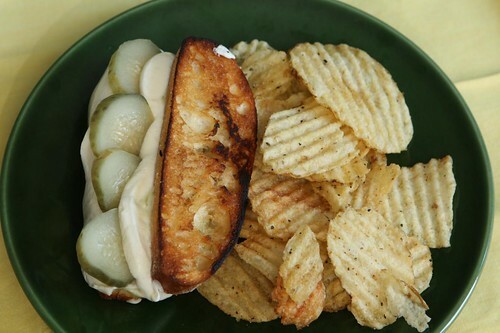 For my take on the Earl's sandwich I grilled some ciabatta slices and melted the mozzarella and pickles on the sandwich and threw it under the broiler. I read "miso" in the description but for some reason I thought "wasabi" so I ended up making a wasabi mayonnaise. The result was extremely delicious even if it was intentional. I have no idea why I didn't see the "miso" which was clearly written. Maybe all Asian ingredients looks the same to me. Since this was from a restaurant called Earl's Beer & Cheese I felt compelled to pair up a beer with this. Also I feel compelled to pair a beer with anything. That also helped. 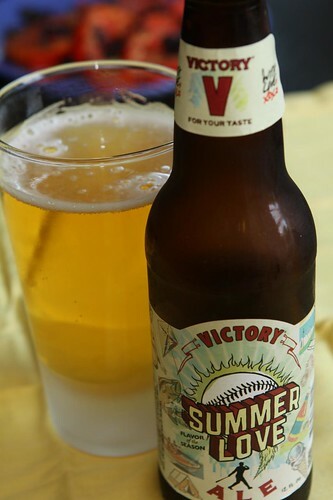 I fought my urge to go Belgian and selected this ale called Summer Love from Victory Brewing Company in Dowingtown, PA. This beer was a lot more bitter than I would have expected but tasty. If you believe in the science of beer pairing (which I do not) then this was a good pairing with mozzarella. What restaurant will I rip off next? Well, you'll just have to keep reading to find out. (Hint: it's Arby's). Many moons ago I visted Downington PA. I can tell you definitively that there was no micro brewery in the town back when dinosaurs roamed the earth.